MROSD "Top Tier Priority Action Locations"
The Midcoast Community Council April 9 agenda is posted with supporting documents on the MCC website. The Midcoast Community Council holds its regular meeting April 9 at 7pm in the Granada Sanitary District meeting room, 504 Ave Alhambra, 3rd floor, El Granada. 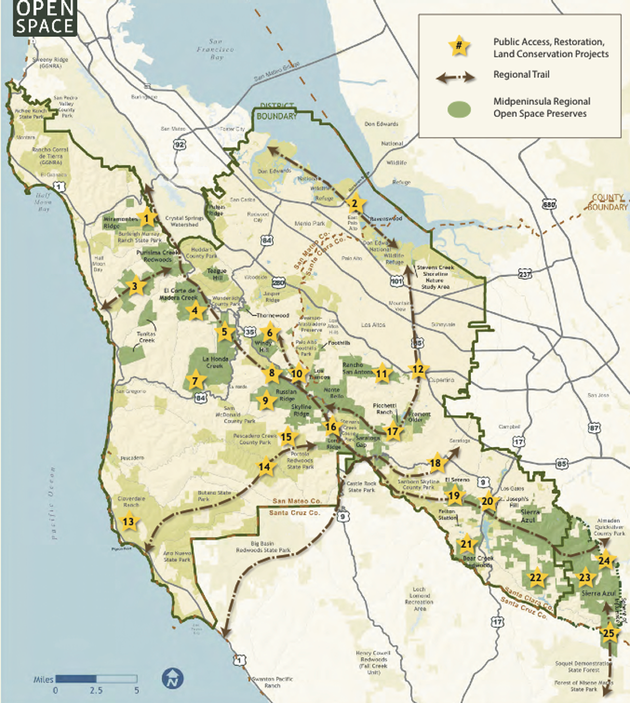 Midpeninsula Regional Open Space District General Manager Steve Abbors will give a presentation on the recently completed Vision Plan and the June 3 Ballot Measure AA, Regional Open Space Access, Preservation and Restoration Bond. This is an informational item only. Initial MCC comments regarding Big Wave Project North Parcel Alternative will be considered (draft comments are posted on the MCC website [pdf]) The project application is not yet complete, but Planning Department staff is requesting early comments from various agencies by April 11. Comments at this time are focused on completeness and accuracy of the application. This is not the time to weigh in with opinions on the project as a whole, which should be directed to the Planning Commission, who are the decision makers, later in the process. Last November MCC hosted an informational presentation by Big Wave Project Engineer Scott Holmes, followed by Q&A. A pdf of the presentation, plus meeting minutes and video, are available on the MCC website on its Big Wave issues page. County staff tentatively plans to circulate the project environmental review document for 30-day public comment in July, followed by Planning Commission hearings in August and September.